According to the National Association of REALTORS®, pending home sales rose 18% from September to October and rose 3% over October 2010. As we have mentioned in previous posts, a home sale is classified as "pending" when a purchase agreement has been signed but the transaction has not yet closed, and typically the sale closes within one or two months of signing. 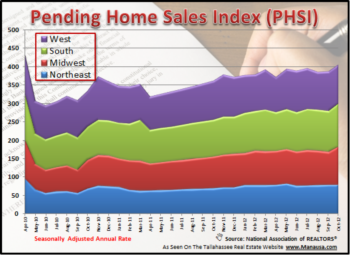 The Pending Home Sales Index thus allows our readers to anticipate the market movement over the next few months. In the South, pending home sales rose 8.6% from September to October and rose 9.7% above October 2010. In Tallahassee, pending home sales dropped 6% from September to October, but dropped only 1% when compared to October 2010. Year to date through October, our number of new contracts is 2% higher than it was at the same time last year. 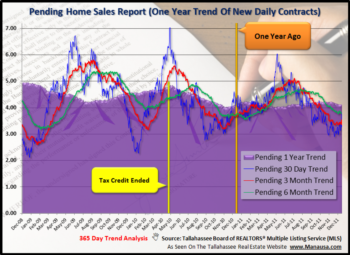 When we look at a real estate graph of pending home sales in Tallahassee, we can see that 2011 has had 5 winning months where the year over year change was positive and 5 losing months where the change was negative. Basically, our struggling real estate market in Tallahassee is doing pretty much the same as it was last year. 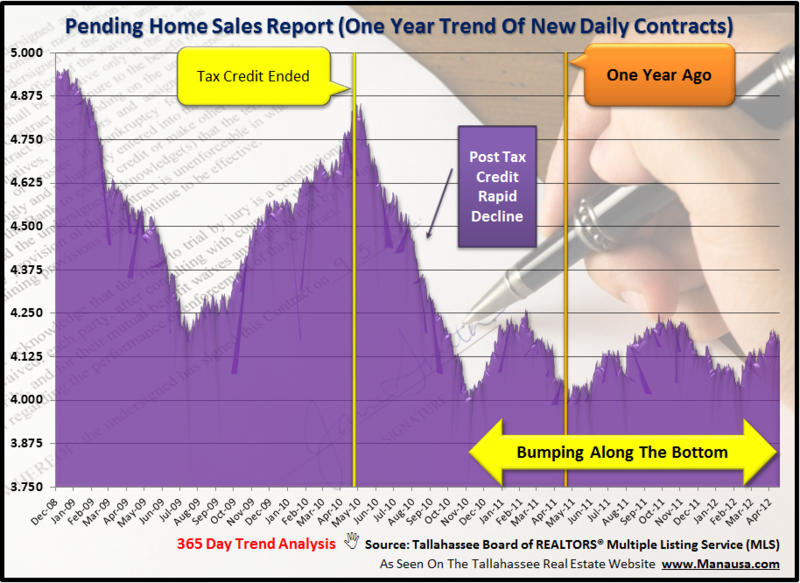 Currently, the rate of home sales is about one half of the level we would expect to see were there not market cycles, so this is definitely a very low spot for Tallahassee. Home sellers should monitor the pending home sales reports that we publish because they will get a feel for demand in the current market. If you want to sell a home in Tallahassee, there has to be a buyer for your home. You can estimate whether the buyer population is growing or receding by studying this report, and this report tells me that buyer activity is receding slightly. Homeowners need to decide to either quickly sell a home to get the highest dollar, or plan on owning the home for several more years until a recovery and consequent rise in prices allows them to sell at a higher price. This is no market to "test" for higher prices, and declining values means you risk losing money while you wait and hope for a higher price. Make sure your real estate agent shows you not only the right price to put on your home, but also how that price was determined when compared to all of the other similar homes for sale in Tallahassee.